After a terribly difficult year for stocks, 2019 started on a better note. Sellers are no longer in control and the S&P 500 is up 5% this year and up 10% off the Christmas lows. Although, the sellers are doing a decent job this morning on American Express (NYSE:AXP) stock, down 2.5%. AXP reported earnings last night and investors did not like what they saw. I disagree with the sellers, so this is a buying opportunity for the long term. The experts on Wall Streets agree, since the stock is still trading well below their average price targets. Up until a week ago, traders believed that financial stocks could not rally. But that is starting to change lately — they have recently bought bank stocks up with both hands. This is thanks to good reactions to the Goldman Sachs (NYSE:GS), JPMorgan (NYSE:JPM) and Bank of America (NYSE:BAC) earnings reports. The Financial Select Sector SPDR ETF (NYSEARCA:XLF) is up more than 4% in the past 5 days on top of a 10% bounce off the December lows. However, AXP stock this morning is not getting the love that the others did this week. Perhaps the disappointing Morgan Stanley (NYSE:MS) report on Thursday morning soured the mood a little on Wall Street. America Express did miss slightly on both earnings and revenues, but nothing that damages its sustainable bullish thesis. AXP is not a bank, but credit card stocks do often trade alongside the traditional financial centers. American Express is financial technology stock, or FinTech, and those are faster movers than banks. Consider one extreme stock of the bunch, Square (NYSE:SQ) stock, which is up 72% in the past year. Visa (NYSE:V), Mastercard (NYSE:MA) and Paypal (NASDAQ:PYPL) are up 13%, 20% and 9% respectively for the same period. 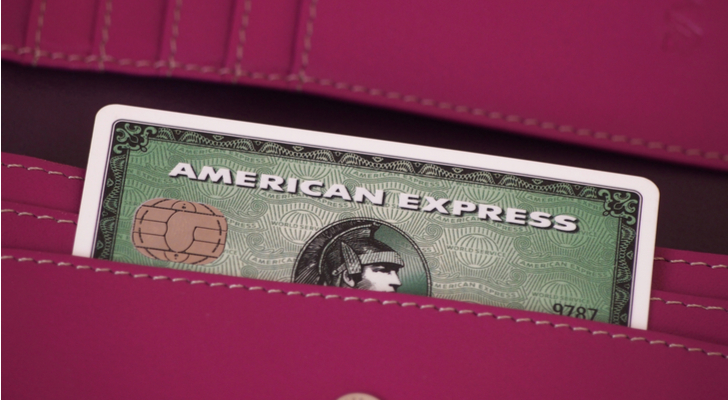 American Express stock is lagging, down 1%, so it has some catching up to do. This is reason number one to own it now — while it still lags. Yes, they disappointed the Street with their earnings, but if the stock market is going higher this year then AXP will recover and rally along. Management stated yesterday that they “are starting 2019 in a position of strength.” This is confidence that I can bank on, and the second reason to buy. Thirdly and perhaps the reason with the biggest upside potential on the stock is China. The tariff war has been terrifying to Wall Street but it also presents a great opportunity for AXP stock. Part of its effort to resolve the face-off with the U.S., China is likely to open its doors to U.S. companies. American Express has the best chance to be the first U.S. mover into a massive market, having already received preliminary approval. It will be competing with Alibaba (NASDAQ:BABA) Alipay and Tencent (TCEHY), but it is up to the task and will be a growth market for it. Last night, management delivered decent guidance for 2019 but lacked the wow-factor. They raised their full year revenues but kept the same range on earnings per share. These days, investors want to see upgrades in guidance. But in the face of so much uncertainty, a cautious management team is a smart one. They are aware and realistic of opportunities and pitfalls. The bottom line and as long as stocks are rising, AXP stock dips are buying opportunities in upwards moving markets. There are some negatives like a slight increase in provisions for losses but nothing too alarming. After all we are in a rate hike cycle and this is when things can go wrong, but this is not 2008. We don’t have flagrant systemic risk. Today’s stocks prices are better founded with much less froth. The negative reaction last night and this morning are too extreme. America Express stock is too good to be punished this harshly on a tepid report. Nevertheless, the short-term reaction to earnings events are always binary so they don’t matter much over time. So luckily they are just that, short term. With time the good fundamentals will prevail over this temporary tantrum. For any bullish trade to work out we first need the macro-economic environment to allow for it. This year we are eliminating the major reasons that plagued the bulls last year. Recently the Federal Reserve assured us that they won’t invert the yield curve on purpose. Now we only need to eliminate the tariff war threat. The rhetoric on that front are also improving as both sides are showing signs of lenience. Click here for a bonus video on Tilray (NASDAQ:TLRY) stock. This is a wild one but there are clues. Nicolas Chahine is the managing director of SellSpreads.com. As of this writing, he did not hold a position in any of the aforementioned securities. You can follow him as @racernic on Twitter and Stocktwits. Article printed from InvestorPlace Media, https://investorplace.com/2019/01/american-express-axp-stock-buying-opportunities/.